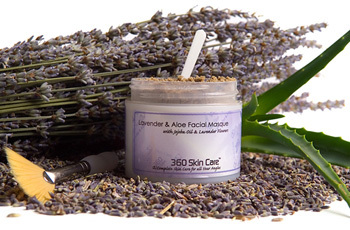 360 Skin Care’s Lavender & Aloe Facial Masque soothes and conditions delicate facial tissue while detoxifying your skin. Lavender and Aloe Vera both have therapeutic properties that heal and replenish parched and weary skin. Coconut Milk contains naturally occurring Lactic acids and vitamins that strengthens and renews aging skin cells and encourages new cell regeneration. Paint brush and instructions included. Devised for use on all skin types. Net Wt. 2oz.